Over the span of about a week and a half, I worked in my Media Arts class to create a poster to raise awareness for global warming. This was not the first idea I had, however, and proved to be the last of many failed trials-and-errors. The main message of my posters are centered around raising awareness for global warming. Besides a traced image of the countries around the world, everything was hand-drawn, including the writing. I wanted to show an image with words across it in large print, so they'd stand out. I chose to draw the earth 'melting' away, but when people saw that, global warming wasn't the first thing they thought of, so I decided to make another poster to accompany this one. The original version showed just the earth and the words, with a white background and black letters. But the problem with this was that the background looked like big empty space. So I made it 'space-themed', changed the word color, and added the bottom 'melting part' of the poster. After adding stars around, the poster was completed. The second poster I made was a sequel to the first. The idea came up when I decided the first poster didn't quite get my message across. In this poster, I showed the world burning, because that is more like what global warming is doing. I chose to do this to show people that the choices they are making change the world, whether negatively or positively. This poster followed the same structure, writing, and background as the first, so they'd look better together. I am still unsure of whether or not the message gets across, but I ended up happy about the structure and general appearance of both posters, so I may still change the wording and/or improve the writing on the poster. The first step to making my frame was to plan. 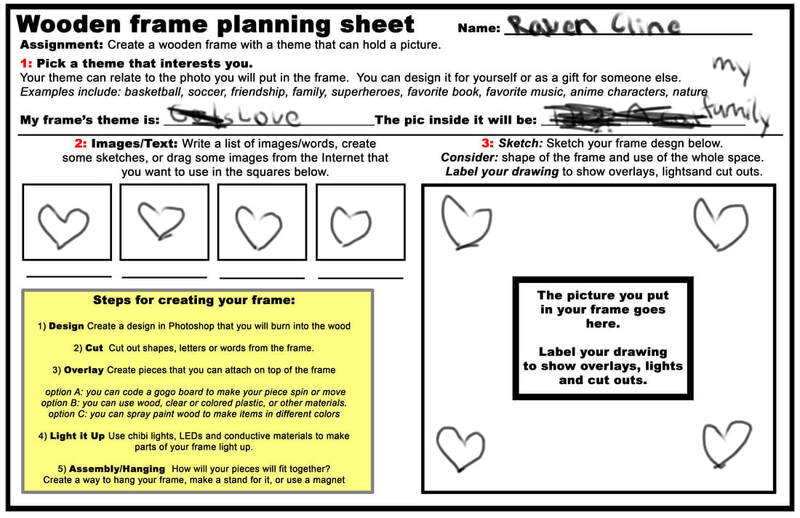 I used a frame planning sheet the sketch out the basic parts. I changed my theme halfway through to make it easier to follow. After that, I began to make the dimensions, of how large, thick and wide the frame would be. Once I'd decided on those measurements, I picked a simple shape to out in the corners of my frame. 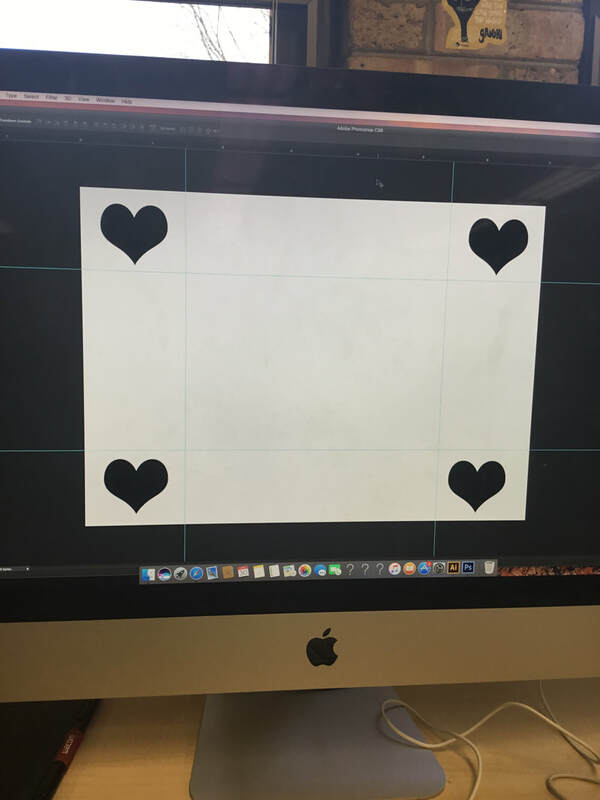 I chose a heart, so I could put an image of someone or something I love in the frame. The next step was to insert the image I wanted on my frame onto the planning sheet in Photoshop. After doing this I went to 10.3.4.18. a website used to compile the frame dimensions and images. I cut it using the laser-cutting machine. Throughout this project I also learned how the speed of the wood-cutting affects how deep the cut is. My final frame! You can clearly see the hearts. My next step is to create a kickstand for the frame. My Minecraft project is finished! The objective was to make a unique rollercoaster based on an animal or something in nature. We based our rollercoaster on a black widow spider, hence the black and red color combination. Morgan, Ben G., Johnson and I built out of nether brick, obsidian, and rails.